Mechtild Rossler for reviewing prior to publication. The Sami are one of Europe’s oldest ethnic groups. They have lived in the region most often known as Lapland, today called Sapmi or Samiland, since prehistoric times. Originally fishers and hunters, they began to domesticate wild reindeer many centuries ago, and reindeer herding became the foundation of Sami livelihood. Hunting and fishing also continued as important traditional occupations. The Sami practiced a shamanistic spirituality rooted in a respectful, harmonious relationship with nature. The land itself was sacred, and it was also marked with specific holy sites. 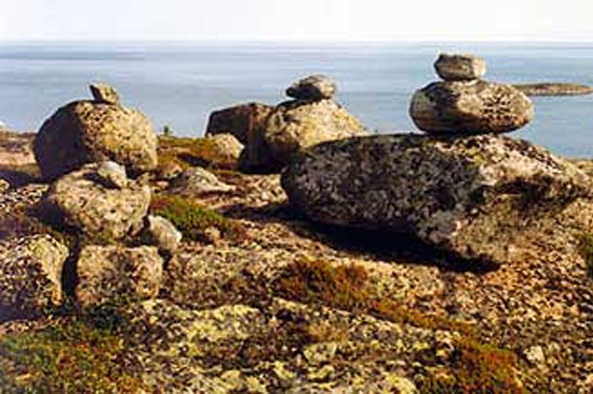 Sieidi (stones in natural or human-built formations), álda and sáivu (sacred hills), springs, caves and other natural formations served as altars where prayers, offerings and sacrifices were made. Through a type of sing-song chant called the joik, Sami conveyed legends and expressed their spirituality. Noiade were individuals who communicated with the spirits and interceded on behalf of the community. As early as the ninth century, the people who now make up the region’s dominant ethnic groups began to move into the Sami homeland from areas to the south, eventually claiming the land and its wealth of resources. From the 17th to 19th centuries, the established governments offered incentives to colonize Sami territory. Much like the plight of native peoples in the Americas during the colonial era, the Sami were pushed off their lands and forced to assimilate into the dominant culture and convert to Christianity. Many believed the Sami were heathens and a backward race and regarded their shamanic practice as devil worship. Sami who attempted to practice their traditional religion were persecuted—some even burned at the stake for “witchcraft”—and holy sites were destroyed. In many cases, they even were forbidden to speak their own language. Throughout the region, laws were created to deny the Sami rights to their land and to the practice of traditional livelihoods. Despite tremendous oppression, many Sami secretly maintained their language, culture and spiritual beliefs and practice. The past 40 years have seen an era of Sami renewal as these native people have begun to recover from the aggressive assimilation policies of the past centuries. They are reclaiming their language, culture, ancestral belief system, even their name. Today they are formally recognized as “Sami” (also spelled in English as Saami or Sámi)—which means “the people”—rather than “Laplander,” a derogatory term imposed by colonists. They now have their own flag and national anthem, both created in 1986. Although they speak several different dialects and maintain differences in culture and livelihood, they consider themselves one people with a common origin. The Sami are also politically unified and engaged in efforts to strengthen their rights to land, traditional ways of life and self-determination. They are active in international indigenous groups and have status as a registered nongovernmental organization in the United Nations. The three Scandinavian countries now have laws and programs in place to safeguard and promote Sami language and culture. In 1973 the Finnish government established a Sami Parliament; Norway followed suit in 1987, and Sweden in 1992. The semiautonomous parliaments are elected by and represent the Sami people within each country. They are subordinate to their countries’ central governments, but public authorities are obliged to consult the parliaments on matters that might affect Sami land, livelihood and culture. In Russia, where the fall of Communism is still recent history, the Kola Sami do not have their own parliament or the legal protections of their Scandinavian counterparts, but they participate in national and transnational Sami organizations and international indigenous bodies. In the 1990s, Finland and Norway amended their laws to allow the Sami the right to use their own language when dealing with the government. In Norway and Sweden, reindeer husbandry and related occupations are the exclusive right of the Sami. However, Finnish law does not offer this protection, and most areas that were once Sami territory are now “public land” where all local people are entitled to herd reindeer, hunt and fish. Efforts are under way to amend the law and return some land to the Sami. In 1998 Sweden formally apologized for the wrongs committed against the Sami. Despite significant strides forward in the past decades, these countries have been criticized by the international community, including the United Nations, for failing to respect the rights of the Sami. Only Norway has ratified the International Labor Organization Convention No. 169 on the rights of indigenous and tribal peoples. Today somewhere between 70,000 to 100,000 ethnic Sami live in the Scandinavian countries and Russia’s Kola Peninsula. About half are in Norway, some 20,000 are in Sweden, and smaller proportions live in Finland and Russia. It is estimated that as many as 40 percent of Sami make a living based on the traditional and sustainable use of their territory, including reindeer herding, fishing, hunting, small-scale agriculture, and the use of natural products to produce handicrafts. Only about 10 percent still practice reindeer herding as a primary occupation, but that land-based way of life still dominates and guides Sami culture. The list of threats to the lands of the Sami, their sacred places and their culture, reads like an environmentalist’s worst nightmare: Oil exploration, mining, dam building, logging, military bombing ranges, tourism and commercial development. Some threats are new, while others have existed for decades. But, at the heart of it all is the Sami’s right to self-determination, defined in large part by control over land and natural resources. In 2003 Norwegian authorities and the North Atlantic Treaty Organization (NATO) announced plans to expand bombing ranges in Halkavarre, northern Norway. The region has served as reindeer calving and summer grounds for thousands of years, and it contains many ancient Sami sacred sites. It is one of the few locations in Europe where low-level flight training can be conducted, and military forces have also proposed testing missile systems in the area. The Norwegian government claims it was not aware of the existence of sacred sites in the area of the bombing ranges; however, the Sami Parliament says the government made plans to expand the ranges without seeking Sami approval. The parliament has sought help from the U.N. International Labor Organization and the U.N. High Commissioner on Human Rights. In Sweden, reindeer grazing rights are the primary area of contention. Disputes erupt annually when enormous herds of reindeer cross between seasonal grazing grounds, some of which is private land. Farmers and foresters contend they’ve suffered substantial economic loss from reindeer trampling new forest or eating crops. In 1996 a Swedish court ruled that the Sami herdsman have no historical right to use private property as grazing land. On Jan. 1, 2007, the Swedish government granted the Sami Parliament jurisdiction over reindeer herding affairs. The Sami Parliament now has authority over issues such as the distribution of fodder subsidies, compensation for losses to predators and herd ownership registration—decisions that used to be made by non-Sami officials. However, issues of land-usage rights remain unresolved and the government shows little sign of action. In northern Finland, logging has had a damaging effect on reindeer herds. Destruction of forests in some areas is preventing reindeer from migrating between seasonal feeding grounds. As trees are felled, reindeer are also losing supplies of an important part of their diet: a lichen that grows on the upper branches of older trees and is their only source of sustenance during winter months when snow is deep. The logging is legal and under the control of the state-run forest system; unfortunately this “sustainable” forest management does not appear to factor in the needs of the Sami and their reindeer. In coastal Samiland, the opening of the Barents Sea for oil and natural gas exploration threatens to accelerate development and potential destruction. Norway’s first natural-gas field, located about 90 miles off the coast, is due to be on stream by the end of 2007, and far more development is expected. In addition, plans are under way to construct a gas pipeline across Russia’s Kola Peninsula to link gas fields in the Barents to existing European pipelines. Oil spills would harm Sami coastal fisheries, while associated development such as the construction of roads and power lines may cut off access to reindeer calving grounds and sacred sites. The World Wildlife Fund has called the Barents “Europe’s last unspoiled marine environment,” home to unique sea bird colonies and the world’s largest cold-water reef. Samiland, which is rich in precious metals, is also threatened by mining operations. In Norway, a strong law supports mining interests; however, Sami pressure appears to have influenced at least one company to suspend exploratory drilling. In Russia’s Kola Peninsula, vast areas have already been destroyed by mining and smelting activities, and further development is imminent. Tourism has also created problems throughout Samiland. The tourism industry in Finland has been criticized for turning Sami culture into a marketing tool by promoting opportunities to experience “authentic” Sami ceremonies and lifestyle. At many tourist locales, non-Samis dress in inaccurate replications of the colorful Sami clothing and hats—mixing specific gender and regional elements—and gift shops sell coarse reproductions of Sami handicraft. One popular “ceremony,” crossing the Arctic circle, actually has no significance in Sami spirituality. To the Sami, this is an insulting display of cultural exploitation. In the late 1990s, Sami organizations brought international attention to the issue by staging demonstrations to expose exploitive activities in Rovaniemi, a popular tourist destination containing theme parks such as Santa Claus Village—where Santa and his elves, dressed in Sami-style garb, reside. In the Kola Peninsula, foreign travel agencies have concessions to sell and organize fishing and hunting safaris, which both impinge on Sami’s traditional livelihood and exclude them from receiving any economic benefit from the tourism. In Norway, 300 to 500 recreational cabins are built every year, most in reindeer grazing lands; studies have shown that disturbance from resorts ultimately causes reindeer to abandon calving grounds. In northern Finland, a water prospecting venture threatens an ancient sacred site and natural spring called Suttesaja. In May 2001 the municipality of Ohcejohka/Utsjoki announced a large-scale plan to divert, bottle and sell the spring water on the world market—without notification or consultation with the local Sami people, who make up 70 percent of the population. Unlike other waterways of the region, Suttesaja doesn’t freeze over in winter, and that special quality is reflected in its name, which means “unfrozen stream.” For the Sami, it has been a traditional sacred site and a place of healing for centuries, and an old sieidi site lies at one end of the spring. The Finnish National Board of Antiquities has registered the area as a heritage site of cultural and historical significance, and the stream itself is part of the watershed that is home to Europe’s largest salmon river, an important source of Sami livelihood. In 2002 the municipality passed a resolution committing itself to a land lease with the Finnish government, which owns the land in which Suttesaja lies, thus putting the plan in motion. In 2003 four local Sami women applied for a judicial review of the municipality’s decision. The regional administrative court issued a summary dismissal on a procedural point, but the Supreme Administrative Court of Finland overturned the decision and sent the case back to the regional court to be determined on its merits. The appeal, which remains pending at the regional court, challenges the municipality’s decision because it failed to properly consult with the local Sami and because environmental and cultural assessments it carried out were biased and inadequate. The women subsequently filed further submissions to the regional court supporting their claim and demanding, among other things, a cumulative impact assessment that would take into account the significance of Sami culture. The Sami are still waiting for this assessment to be made. Some Sami lands have received international protection. In 1996 the UNESCO World Heritage Committee designated a 3600-square mile region in Sweden as a World Heritage cultural landscape. Called the Laponian Area, it is recognized both for its important natural features—mountains, wetlands, forests and glaciers—and for its cultural significance and ongoing ancestral way of life. The committee has recommended expanding the area into Norway. The Finnish government has submitted “the holy place of worship of Ukonsaari by the Sami people at Inari” to the UNESCO Committee and it is currently on the World Heritage Tentative List. Ukonsaari is a small, rocky island in the middle of Lake Inarinjarvi; on one side of the island is a sacrificial cave. Samis assert that they possess collective and private rights to their traditional land, and that their continued habitation and use of the land precludes any state’s claim to a so-called right of discovery or occupation. Although some threats are being dealt with individually, experts contend that problems will persist until the larger issue of Sami rights is resolved. The future of important reindeer calving and seasonal grazing lands is also at stake; it is estimated that a third of traditional grazing lands already have been lost to encroaching development. Kuokkanen, Rauna and Marja K. Bulmer. “Suttesaja: from a sacred Sami site and natural spring to a water bottling plant? The effects of colonization in Northern Europe.” In Echoes from the Poisoned Well: Global Memories of Environmental Justice. Lexington Books, 2006. Madslien, Jorn. “Russia’s Sami fight for their lives.” BBC News, Dec. 12, 2006. Nellemann, Christian and Ingunn Vistnes. “New bombing ranges and their impact on Saami traditions.” The Environment Times/Polar Times, October 2003. Resource Center for the Rights of Indigenous Peoples. “We are the Sámi—Fact Sheets.” Gáldu. Suoma Sami Nuorat. “Protests against the exploitation of Sami culture.” Suoma Sami Nuorat. The Swedish Institute. 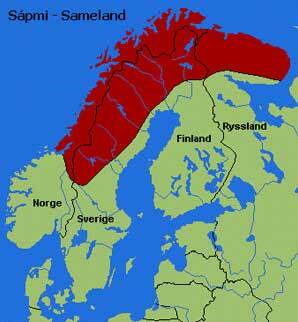 “The Sami People in Sweeden.” Samenland. “What is good for the reindeer is good for the Sami.” University of Calgary Gazette, Oct. 21, 1996. United Nations Educational, Scientific and Cultural Organization. “Laponian Area.” UNESCO World Heritage Center. University of Texas. Sámi kultuvra—Sami Culture.